Written as part of CNN's Destination Adventure series. Destination Adventure takes a look at travel locations for the explorer at heart. 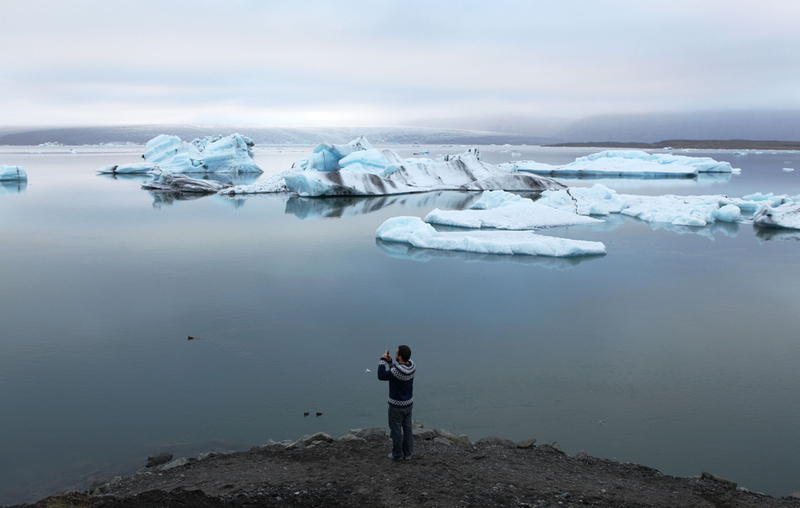 After publication, readers were encouraged to share their Iceland stories on CNN iReport. I contributed the article, video and photo gallery to the series after a personal vacation with friends. (CNN) — What’s that? Another amazing waterfall cascading down a rich, green, mossy mountain? If you’ve seen one, you’ve seen them all, right? No, of course not! But that’s a thought I discussed with my friends as we drove along the southern stretch of Iceland’s Route 1, the 830-mile “Ring Road” that circles the country. We were being spoiled by scenery. Waterfall after waterfall, geysers, glaciers and geothermal hot springs, cute towns, galloping horses, lava plains — it was almost too much. There are lots of ways to meander along the Ring Road. Buses run regularly, especially during the summer. And there are lots of cyclists and hikers to be seen, hoofing it with their sleeping bags and backpacks on the side of the road. There’s even a large hitchhiker presence, with Iceland being a remarkably safe country. But for our nine-day trip, we wanted the freedom to get off-road and still make our return flights, so we chose to rent an SUV. The Ring Road is (mostly) paved, but outside of towns, many of the side roads are gravel, and the mountainous roads usually require a four-wheel drive. 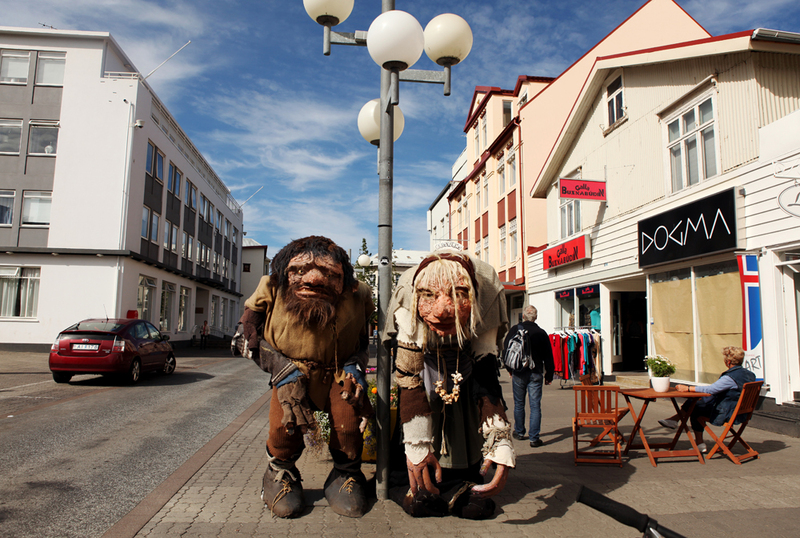 Fly into Reykjavik and get over your jet lag by wandering down busy Laugavegur Street for some good shopping. The eye-catching building that looks like a space shuttle in mid-launch is Hallgrímskirkja, the biggest church in Iceland. It manages to be dramatic yet completely bare in all of its concrete glory. Shell out 500 krona (a little over $4 USD) to visit the top of its tower and see the best view of the cute rooftops of Reykjavik. Head back to Laugavegur in the evening to partake in Reykjavik’s notoriously lively bar scene. 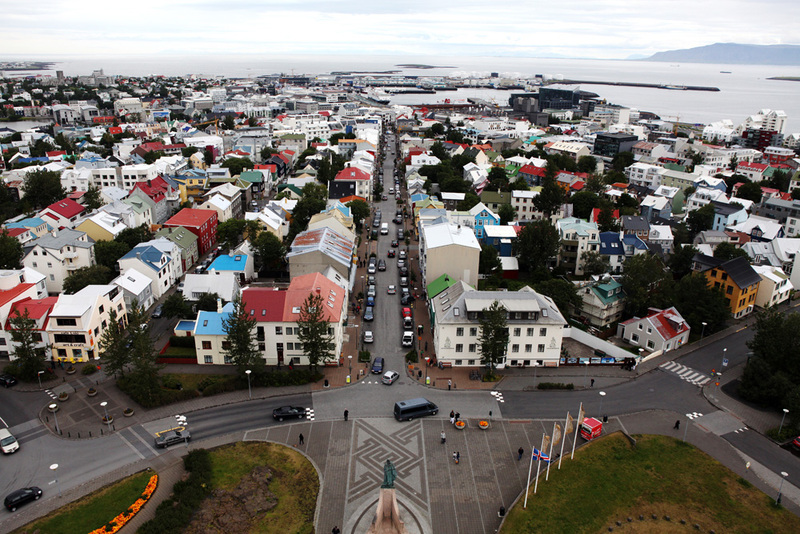 The city of Reykjavik as seen from the top of the Hallgrimskirkja church. 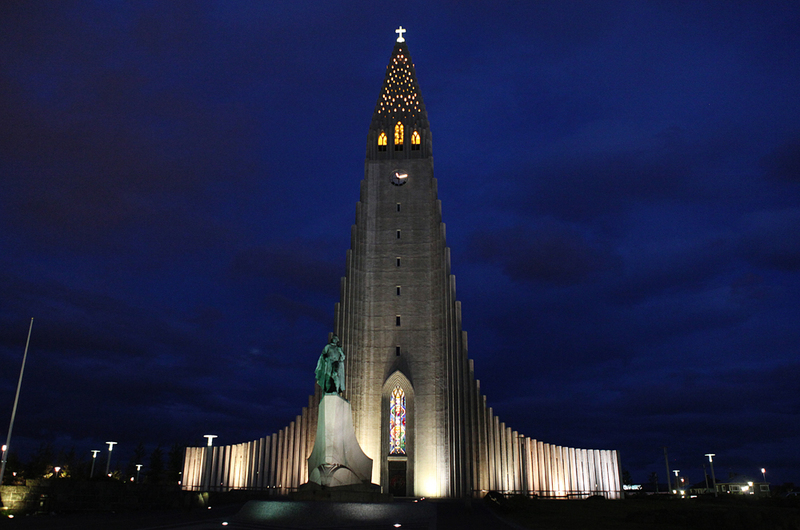 Hallgrmskirkja, the biggest church in Iceland, is thought to have been designed to resemble the basalt columns that are found in Iceland. The statue in front is of Leif Eriksson. Just outside of Reykjavik is the Golden Circle, a quick tourist loop that can easily be covered in one day. The national park of Þingvellir is the site of the world’s first democratic government, the Alþing, established by the Vikings in 930. And leave it to the Vikings to establish said government in a tectonic plate rift. The Eurasian and North American plates meet here and are gradually drifting apart. It’s one of the few places in the world where the fault lines and rift valley are so clearly visible. The second stop is to see the Geysir. Not just any geyser, this is the original Geysir. Every other one in the world is named after it. Unfortunately, overenthusiastic tourists with rocks plugged up the once 260-foot-high spout in the 1950s. It still erupts, but not nearly as consistently nor as grandly. 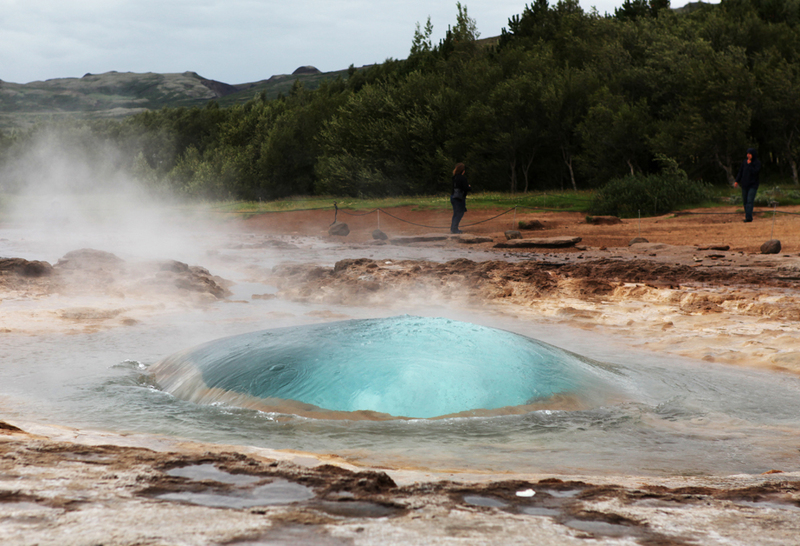 Its slightly smaller and extremely reliable neighbor, Strokkur, goes off about every six minutes. The last stop on the circle is Gullfoss, or golden waterfall. The amazing two-tiered waterfall is said to look gold on a sunny day, though it was more grayish-silver on our drizzly visit. I think it was almost better that way, kicking up even more gray and white froth as the water rushed over the first short staircase, before taking a turn to completely drop and nearly disappear into a 105-foot crevice. The two-tiered waterfall of Gulffoss (“golden waterfall”) is one of the three stops on the Golden Circle. The Strokkur geyser, seen here just beginning to erupt, is the smaller neighbor of the original Geysir, which no longer erupts with the consistency and height it once did. We chose to hit the road heading counterclockwise. But it wasn’t long before we left the Ring Road and turned inland, eventually tackling our first rocky road en route to Landmannalauger, a nature reserve known for its beautiful, colorful mountains. Our goal was a campsite near the Landmannalauger hut. But more importantly, we wanted the hot spring next to the campsite. Here, a cold stream and a geothermally heated hot stream flow from beneath a mountain and meet to form a perfect natural hot tub. It’s a surreal experience in the midnight twilight. Leaving Landmannalauger, continue along route F 208 through the Fjallabak (behind the mountains) area. Make sure the weather is looking good, though, and that your car is up for the challenge, because you’ll be fording a few rivers. Just follow the other tire tracks and watch someone else do it first if you’re unsure of the water level. A hot spring near the Landmannalauger hut and campsite is the result of a cold stream and a naturally heated hot stream flowing from beneath a mountain and meeting to form a perfect natural hot tub. 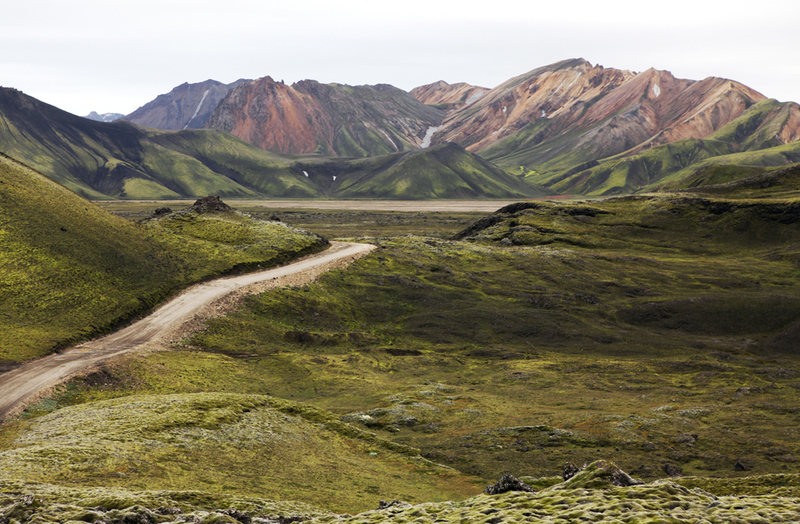 Colorful mountains along road F 208 on the way to Landmannalauger in south Iceland. 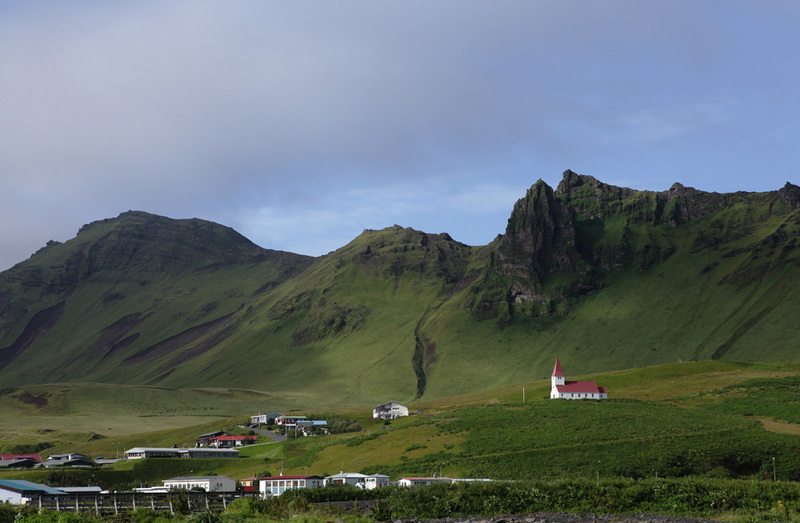 You’ll rejoin the ring road just past the small town of Vik. So backtrack a bit to see the cute town’s famous black volcanic sands and jagged offshore rock formations that are said to be trolls who tried to drag a boat out to sea and were frozen at dawn. 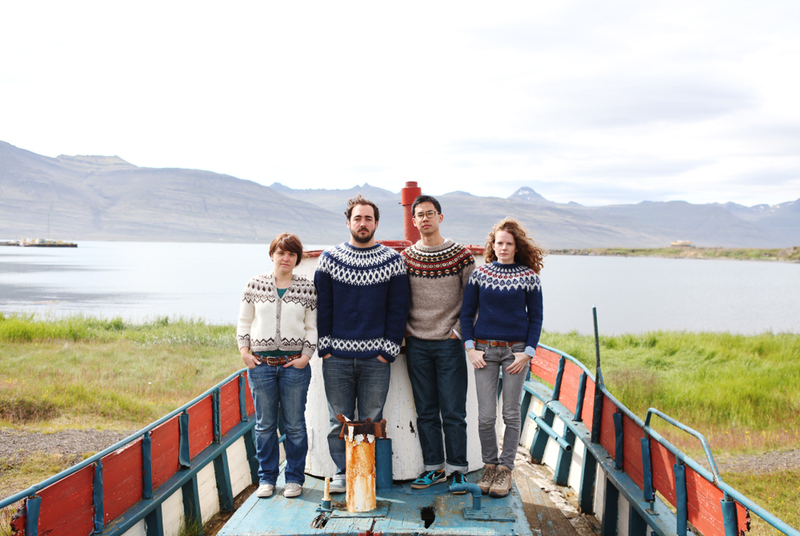 Duck into Vik Wool if the many roadside sheep have inspired you to seek out a warm Icelandic sweater. The small town of Vik  My«rdal in southern Iceland is known for its black volcanic beaches. The glacial lagoon of Jokulsarlon contain blue icebergs that have broken off of Breidamerkurjokull glacier, an extension of the massive Vatnajokull glacier. Moving east, you’ll find the beginning of route F 985, a beast of a road that we were warned against but drove up anyway. The almost 10-mile gravel path proved to be not quite as bad as expected, but it’s certainly not one for a nervous driver, non-4WD, or even remotely foggy day. The road is one of a few ways to access the massive Vatnajökull glacier, the biggest glacier in Iceland and all of Europe. The road ends at the Jöklasel Hut, where the Glacier Jeeps company will lead you on amazing skidoo ride across the ice. Just don’t forget to stop and give yourself a moment to take it all in. Crisp white snow, with patches of ash, flat plains broken by mountains: you’re on a glacier. And when is the last time you got to wear a one-piece snow suit? 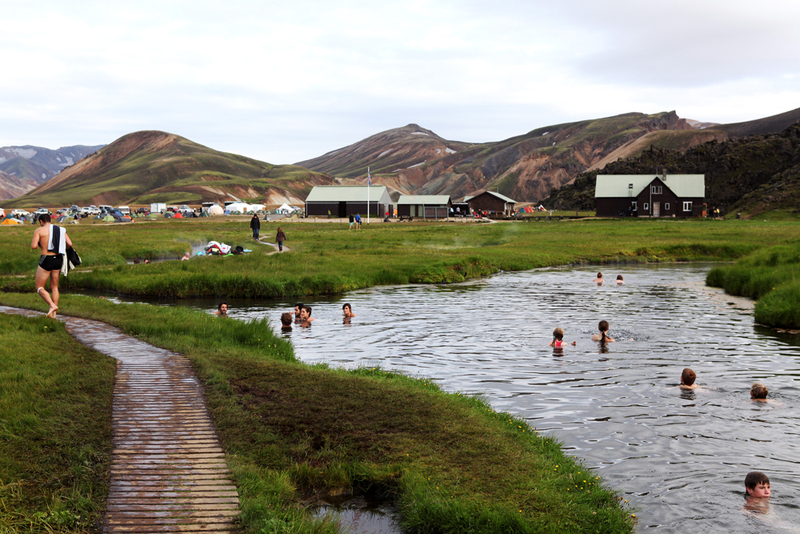 To warm up, drive east and stop in Höfn to participate in one of Iceland’s favorite pastimes at the local swimming pool, which of course has geothermal hot pots. 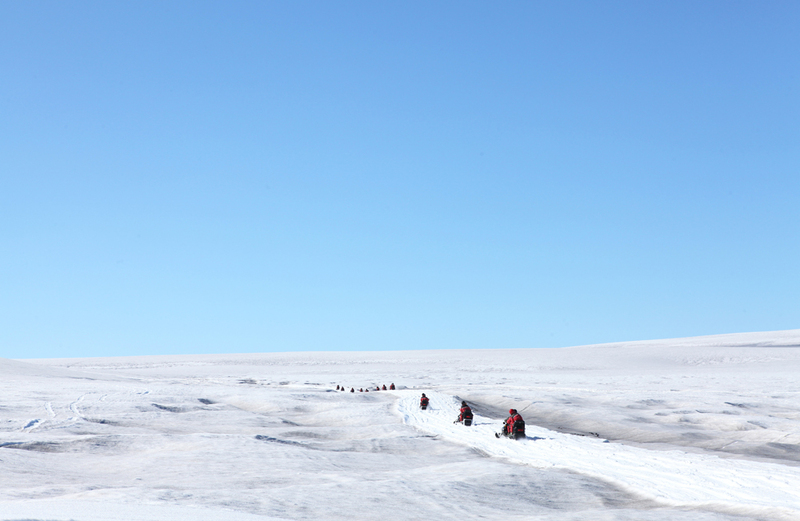 Take a skidoo ride across Vatnajokull, the biggest glacier in Iceland and all of Europe. The huge glacier covers 8% of the country. Turning north, the ring road follows the ins and outs of the east fjords, passing through a number of small towns. The road occasionally gives you the option to bypass a fjord, ducking into a nearly four-mile long tunnel and showing up on the other side of a mountain. 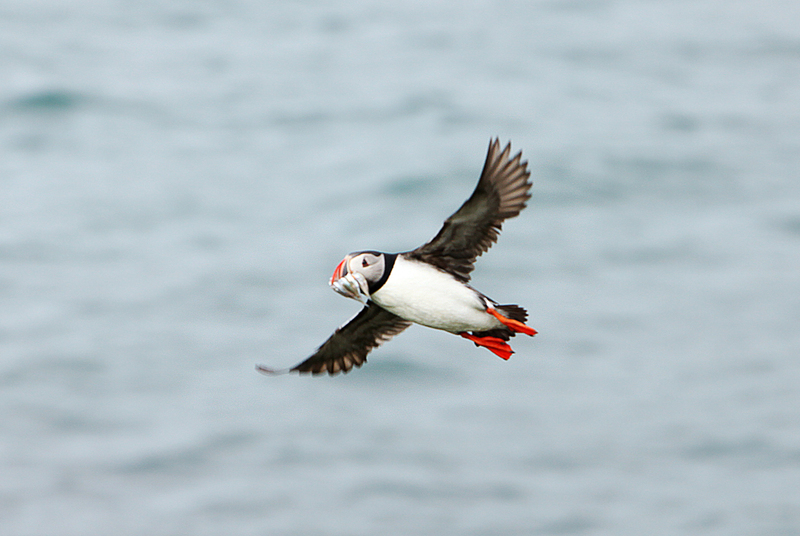 We had one goal for the east: Puffins. There are more of these cute orange-beaked birds in Iceland than anywhere else in the world, and one of the best places to see them is the islet of Hafnarhólmi, near the very top of the east fjords. An estimated 10,000 puffin couples nest here every summer. Plan your timing: we were told that the birds are usually at sea during the day, and then return to the cliffs in the evening. A puffin carries its catch near the islet of Hafnarhlmi at the north end of the east fjords. You’re driving west now, so take note of what we learned the hard way. West means driving into the sunset. And Icelandic summers have extraordinarily long sunsets. The light is downright blinding if you time your drives poorly. Beautiful, but dangerous. The highlight of the northeast is Mývatn, a volcanic area with thousands of years’ history of smoke and lava, craters and fumaroles. It’s a beautiful place to break out the tent again, but be ready for the swarms of flies in the morning. The flies are unavoidable, so you may as well go on a horseback ride and accept the offer of a mosquito head net. Altagerði farm, on the west shore of the lake, will show you around the lava fields from atop a pure-bred, pony-sized Icelandic horse. 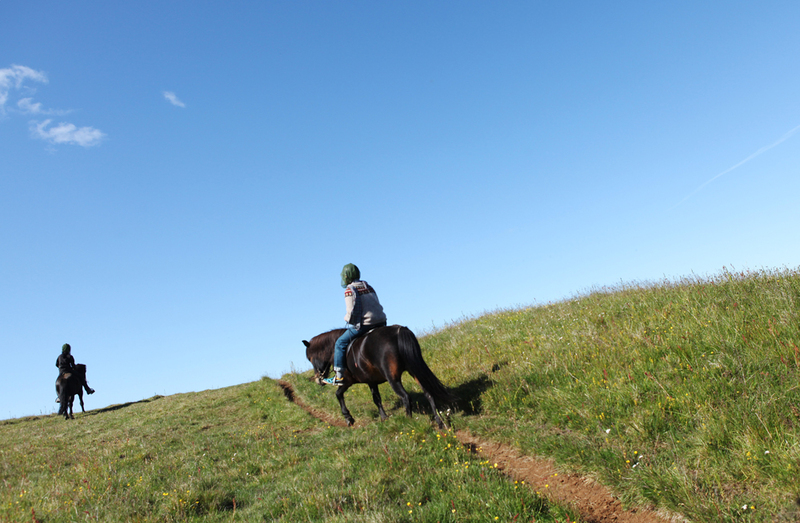 Take a ride around the lake at Mývatn atop a purebred Icelandic horse. From Mývatn, continue west, then north, to the harbor town of Húsavík. Join one of the two whale watching outfits there (we chose North Sailing) for an evening whale watch aboard an old wooden fishing boat, some of which are actually repurposed whaling boats. And get cozy in your second one-piece winter coverall of the week. If you’re lucky — and most are in August — you’ll see at least one of the 11 species of whale that visit the bay every summer. 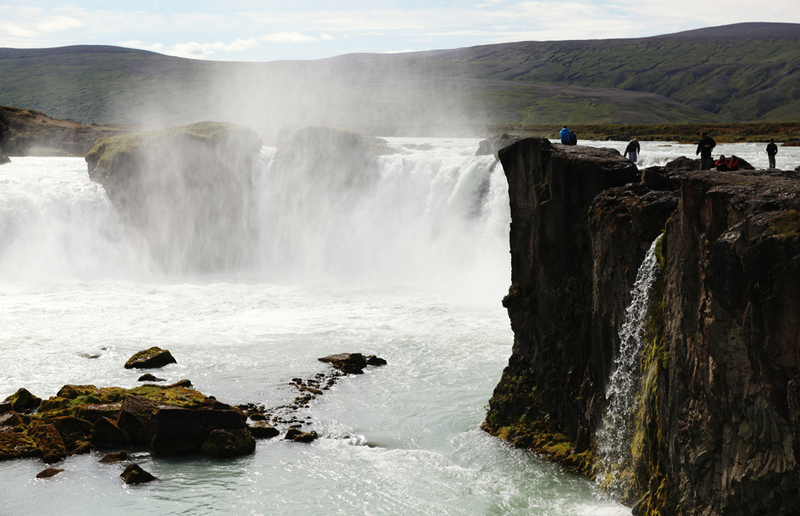 Just south of Húsavík, stop at the beautiful Goðafoss, the waterfall of the gods. It’s named for when, in the year 1000, the lawspeaker of Iceland made Christianity the official religion of Iceland and threw the carvings of the old Norse gods into the falls. Pushing west, the town of Akureyri is the second-biggest city in Iceland and a good place to stop for lunch and a wander. It is also the only place outside of Reykjavik that seems to have parking rules, so find yourself a dashboard parking clock and you’ll avoid a ticket. 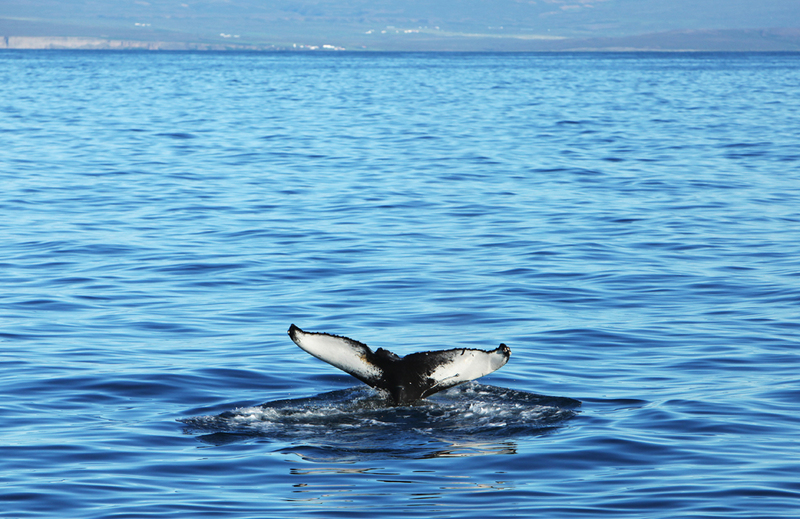 A humpback whale exposes its fluke while taking a dive in the bay outside of Husavik, Iceland. Godafoss, the waterfall of the gods. In 1000, the lawspeaker of Iceland made Christianity the official religion of Iceland and threw the carvings of the old Norse gods into the falls. The northern town of Akureyri, the second-biggest town in Iceland. Needing to get within an easy day’s drive of Reykjavik, we drove on toward the small town of Húsafell in the west. Nearby, you’ll find Europe’s biggest hot spring of Deildartunguhver. Its constant boiling water and clouds of steam are beautiful but used for local heating purposes only; it’s entirely too hot to bathe in. So instead, visit the Ferðaþjónustan Húsafelli, which hosts another one of Iceland’s amazing local swimming pools. 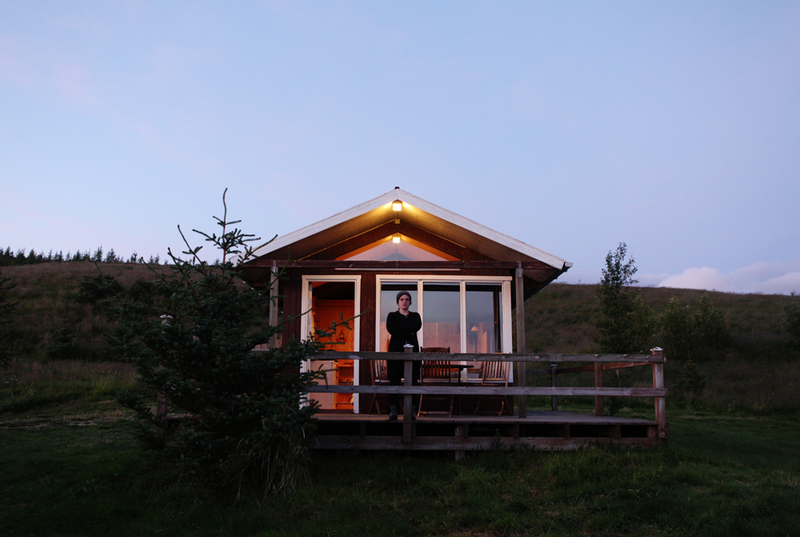 Drive a little out of town to the guesthouse at Fljótstunga farm and stay in one of their cute private cabins. The farm has been run by the same family for generations, and there are plans to turn it into an artistic residency, but for now, it’s the perfect place for a quiet last night in the countryside. 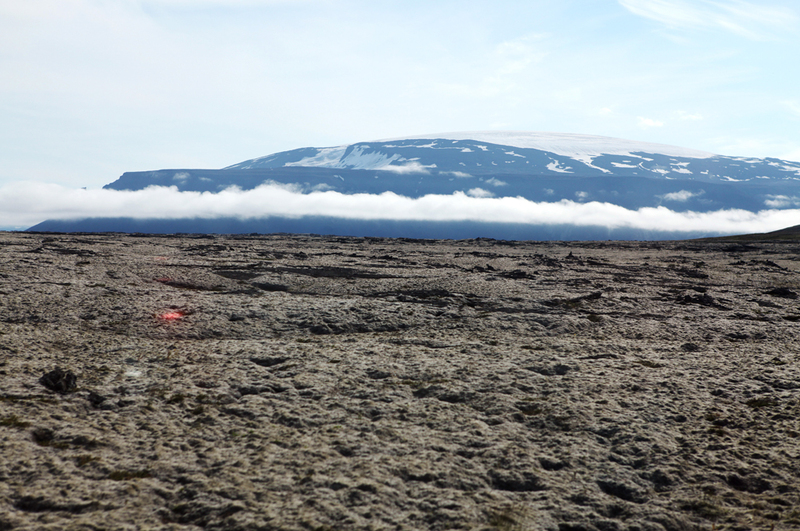 In the morning, explore the lava fields of Hallmundarhraun and visit one of the three major lava tubes in the area. The biggest, Viðgelmir, is owned by Fljótstunga, but if you don’t have time for a full tour, you can take yourself on a shorter visit to the lava tube Surtshellir. These tunnel caves were formed when hot flows of molten lava shot beneath an upper crust of hardened lava. You can venture further in if you have a headlamp, but be careful not to touch any of those lavacicles as they won’t grow back. The guesthouse at Fljtstunga farm offers private cabins. The farm has been run by the same family for generations and there are plans to turn it into an artistic residency. 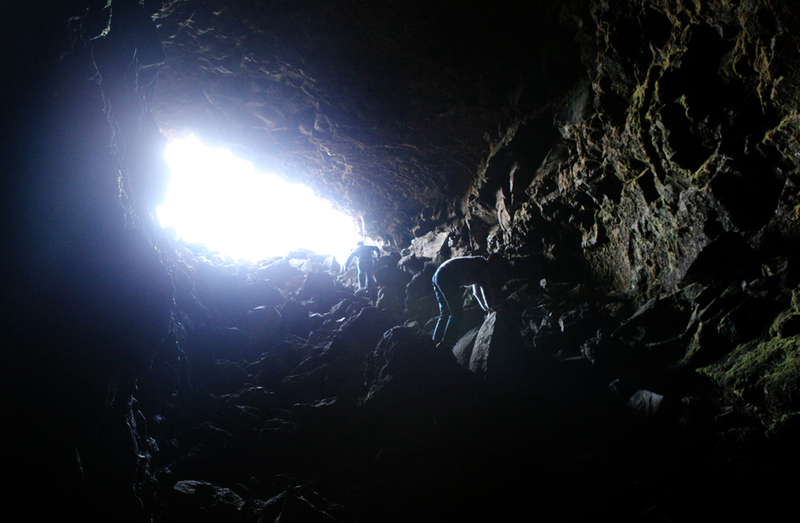 The Surtshellir lava tunnel is open for anyone to explore. Lava tunnels are formed when hot flows of molten lava shoot beneath an upper crust of hardened lava. The lava fields of Hallmundarhraun were formed after a volcanic eruption in 900. Finally, drive south back toward Reykjavik, bypassing the city and heading straight for the famous Blue Lagoon. The warm, milky-blue lagoon is actually runoff from a nearby geothermal power plant. The steam from the naturally heated water is used to run turbines to produce electricity, and the runoff water is allowed to flow into the neighboring lava field, creating the lagoon. The water is rich in minerals and algae. So don’t be surprised when you see everyone masking their faces with white silica mud. Then relax and spend your last few hours in Iceland enjoying the perfect water before the flight home. The Blue Lagoon is the most visited tourist attraction in Iceland. 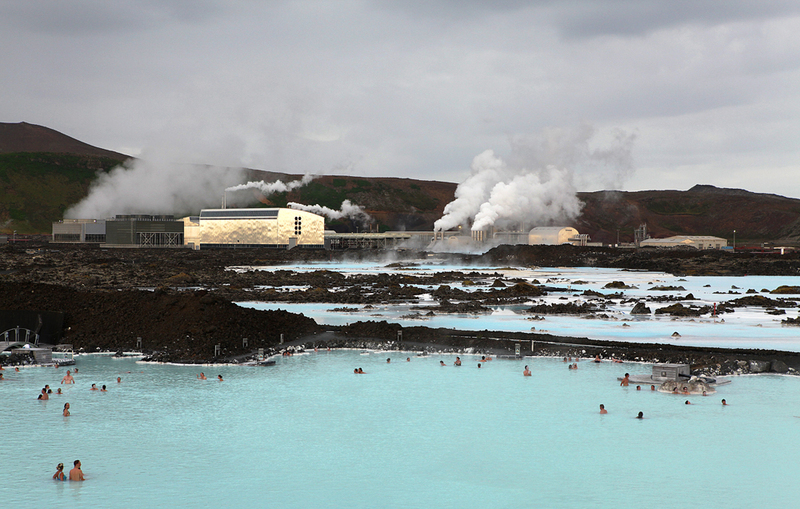 The warm, milky-blue lagoon is actually runoff from a nearby geothermal power plant.